The Minnesota Department of Education recently awarded Augsburg College a 2007-2009 Math and Science Partnership Grant for the next three years. Accepting the check for $441,237 were Linda Stevens, Education Department, and Tracy Bibelnieks and Matt Haines, Mathematics Department. The grant provides funding for the development of a mathematics course for K-8 charter and magnet school teachers to improve their mathematics understanding, problem-solving skills, and mathematics techniques. The Minnesota Department of Education received applications from 12 organizations. Out of the 12, only 5 were chosen. Augsburg is the only college in the metro area funded for mathematics instruction. The program requires that states award funds through a competitive process to partnerships of at least one high-need school district and one institution of higher education. Schools in partnership with Augsburg are Sojourner Truth Academy, Friendship Academy, Aurora Charter School and Metro Deaf School. 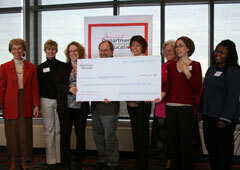 Education Commissioner Alice Seagren awarded the checks at a celebration held at Hamline University Feb. 12. Other organizations receiving the grant are: American Indian Science and Engineering Society, Hamline University, Minnesota River Valley Education District and St. Cloud Area ISD 742.